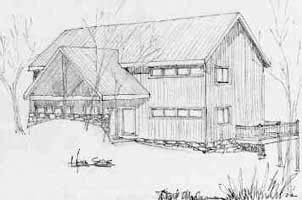 This engineer client loved a plan he had for a mountain house but he understood how difficult it would be to build it on his extremely steep property. He didn't realize that his budget was way too low to build that house. So I needed to design something that included what he loved about that house, make it much easier to build on this steep lot, and reduce its size to stay wthin budget. This site was so extremely steep, I could not walk down the driveway. I measured the slope so I could design a house that would fit. I measured the width of the lot to determine how long we could make the house. Photographs were taken to document the direction of the views. The proposed plan was laid out to fit within the dimensions taken from the site. This would help reduce building costs. Calculating the budget, we were able to determine how many square feet he could afford. This also helped us determine the dimensions of the house. Other ideas were included to reduce costs. The original plan had much more glass. My plan reduced the glass to just face the best view, the lake. Minimal glass was used elsewhere for light and cross breeze. The roof shape was also simplified to reduce costs. All of these ideas would reduce maintenance and energy costs too. To improve the value of the home I planned for accessibility. 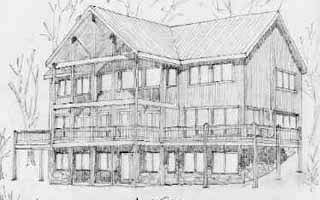 Whether selling or renting a mountain lake home, many need an accessible home. And we never know if we might need that too. While the client appreciated all the thought put into this plan, and loved the plan, it was not built.